No. 6, Jalan Anggerik Mokara 31/50, Kota Kemuning, Section 31, 40460 Shah Alam, Selangor, Malaysia. 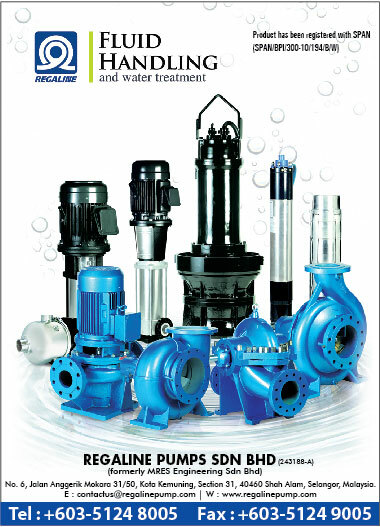 We are a supplier of pumps. Pumps are essential in our daily lives for the transferring, boosting and handling of fluids. Our products include a comprehensive range of centrifugal pumps in single and multiple stages, submersible pumps and other pumps for special services. Brands that we represent include Regaline, Yam, Espa, Caprari, Flojet, Piusi, Delta, Zilmet, etc to cater to different applications and requirements. Our pumps are widely accepted and used in building services, water supply, wastewater treatment, industrial and environmental sectors. The company was founded in Malaysia more than 20 years ago to provide the local market with pumps and machineries of reliable quality by reputable manufacturers. In the early 1990s we began our joint venture with Regalreef Asset Pty Ltd (Australia) which specialises in the production of complete series of international standards (DIN 24255, ISO 2858, NEMA) REGALINE cast iron end suction centrifugal pumps, in-line pumps, horizontal and vertical split casing pumps, vertical multistage pumps, submersible pumps and variable speed systems. 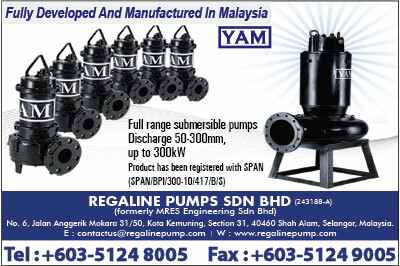 The joint venture was fully taken over by Regaline Pumps Sdn Bhd (then known as MRES Engineering Sdn Bhd) in 2000 and the manufacturing base officially established in Shanghai, China. In 2008 we successfully acquired a Malaysian pump factory specialising in the manufacture of submersible pumps. Our team comprises of professionals with over 30 years of experience in the water and pump industry.